This page continues our discussion of finite and permutation groups from this page. Here we look at how to define and categorise the groups in a more formal way. Specify each permutation in the group by using the arrows (as shown in the triangle example) for each permutation. Specify each permutation in the group by using the cycle notation for each permutation. Use the Cayley table for the group. But is there any other way? 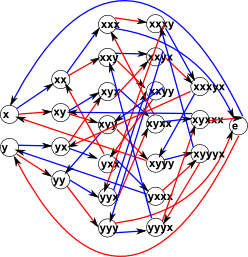 It turns out that we can specify the group by its generators plus a set of relations among the generators (relations that produce the identity element are usually written without the equals sign). 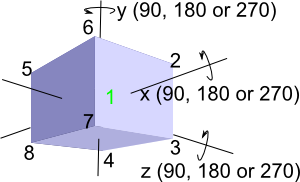 Can we use this to generate all the entries in the table and thus completely define the structure? Doing this for all the other entries in the Cayley table shows that this completely defines the group. How can we work out the minimum set of relations that will define the group? So a free group (which nas no relations) is infinite because, each time we apply a generator, a new element is produced. So, in the table below, I have started adding relations to see how many we need to add to make the group finite. I first added one relation (a²=1), this prevents a sequence of 'a's but we can still have a potentially infinite sequence of 'b's or an alternating 'ababa…' sequence. I then added (b²=1), but this still allows a potentially infinite alternating sequence 'ababa…'. It was only when I added a third relation that the group became finite. (rotation and reflection of a triangle) see this page for full description. The concept of a 'presentation' is discussed on the page here in a more general algebraic structure context. Fearless Symmetry - This book approaches symmetry from the point of view of number theory. It may not be for you if you are only interested in the geometrical aspects of symmetry such as rotation groups but if you are interested in subjects like modulo n numbers, Galois theory, Fermats last theorem, to name a few topics the chances are you will find this book interesting. It is written in a friendly style for a general audience but I did not find it dumbed down. I found a lot of new concepts to learn. It certainly gives a flavor of the complexity of the subject and some areas where maths is still being discovered.